Sneezing woke me up this morning, endless sneezing. Rather than stay in bed and wake boy-child completely (he stirred enough to lean out of bed to investigate whatever monster was lurking under the bed!) I decided to continue my sneezing alone, downstairs. It was before 6am and still dark. Instead of sitting alone being annoyed that I was awake and that I was sneezing, I decided to make the most of the morning and start on creating the new me – the one who is determined to regain some semblance of fit and healthy. I pulled on a pair of trekking shoes, only because my runners were no where to be seen, and headed out for Day 1 of the C25K program. Seriously. Are you the only f*cking person in this house? Your actions would certainly indicate so! Instead of yelling and screaming about how freaking selfish he was. I threw my clothes on, over a post run sweaty body and stormed off downstairs. I was so pissed at not having that 5 minutes of luxury that I couldn’t see past it. I got downstairs and everything just drove me nuts. The fact that I didn’t get time to do any grocery shopping meaning that meals this week will be made from the little bits of whatever that happens to be in the fridge or freezer. The fact that I was making dinner for tonight this morning. The fact that today is just another crap day that can surely only get better. Moral to the story – don’t get between me and my desire for a shower OR stop being a selfish asshat, your actions and inactions have an impact on others! Life is busy, I get that and I need to work out strategies to be able to ensure that we all get healthy and ideally delicious meals. With someone who has battled disordered eating, I also need to make sure that I make time to eat as I find it too easy to make excuses to skip meals. I know that I should menu plan, but not only is it the struggle to work out what to cook, but it is now a case of when to cook it. Life is getting busier and I know that the kids have missed out on so many opportunities because I have been ‘absent’ so I don’t want them to miss out any more. It is now time for me to work out the logistics of how I can actually achieve the lofty goal of getting the kids to where they need to be and being able to feed them! As long as there is food in the house, breakfasts and school lunches can just be made up along the way, it is dinner that needs the work and planning. Monday – Kids are at work with me for a sport and rec program, we should be home at 6. The boy-child needs to be fed and out the door for Scouts by 6.40 at the latest. Dinner needs to be prepped, cooked and eaten in less than 40 minutes! Tuesday – I am actually attempting to do something for myself – I have signed up for a new hockey class (the one I want to do doesn’t fit in with the commitments of other members of the family so hello a new night and another night of dinner challenges) so I leave here at 4.45 and won’t be back til 8 or so. Dinner needs to be made before I leave for hockey. Wednesday – Finish work at 4 and head home to collet the kids, we have to be out the door by 4.30 for their classes/sport. Get home around 6.30. Make sure that there is a substantial meal/snack ready for the kids to eat after school so that they have the energy for classes. Ideally the second round of dinner would also be prepared before we get back. Thursday – I work an unofficial split shift. In the almost 2 hours between, make dinner and hang with the kids. Get home from work around 8.30, most likely too tired to eat myself and will crawl into bed after saying goodnight to the kids. Friday – Hooray for the one night of the week that I don’t have to work late, run around after kids or do anything specific. The one night where I really want to just eat takeout but realise that we have a huge day ahead starting crazy early so need to eat something healthy! Saturday – the day begins at dark o’clock with sports and doesn’t finish until stupidly late if we manage to make it to all commitments. Ideally I will have prepared savoury muffins, zucchini slice and snacks to take. Reality will be feeding the kids toast as we run out the door, a few protein snacks for them after training and the rest of the day will be whatever we can get our hands on. Of course that translates to hot chocolates to defrost and hot chips because they smell so good. Perhaps we will sneak home for an hour or so, or maybe even out to stock up on food for the coming week, more than likely we will grab more fast food to round off the day. Sunday – more training that begins at even darker o’clock, followed by more sport. If we are lucky, I will get time to go and get food for the coming week, if I am really lucky I will delegate the job of getting food for the week! Ideally I will even prepare a batch of meals that can be heated quickly during the week. Realistically, it will be more the case that I will be so overwhelmed by it all that I will hope that the fridge and cupboards are miraculously able to refill themselves with delicious meals and I can enjoy not being busy for 3 seconds. Somehow, I need to work out when to menu plan and shop so that I can make a week’s work of meals on the day of the week that is yet to be found or get up even earlier in the morning to make breakfast, lunch and dinner before leaving for work! Any recommendations for healthy, energy packed meals that are easy to prepare and reheat? So it seems that I will be making a comeback to the world of personal blogging. I have been loitering in the world of social media, wanting to get back in there but didn’t know where to start. Now I have a starting point – I am joining in with a some awesome peeps who are all a part of a Facebook group that started off as Operation Move – a super supportive group of people encouraging each other to get out there and get moving. I haven’t been so active in the group, or in real life and my mind and body are showing the effects. Within this group, there are a few of us who would be happy to shed a few kilos, find a healthier way to live or generally want to be accountable about their food consumption and exercise levels. Together we are all taking part in My Blackmores, an online health and wellness group and will all hopefully find a new healthier way of living, perhaps even shedding a few kilos along the way. My main goal for joining in is all of the reasons I have listed above, to get healthier, to eat better, find more energy and be more accountable about what I eat and do. For far too long, I have been lacking in energy and motivation, have been fighting the ill-effects of whatever it is that has been ailing me. Recovery isn’t happening on its own so now it is time to actually make some real changes. So, tomorrow morning I will be starting off on a 2 week detox. I think I may have dived into the deep end but I figure that a low cal, clean eating plan for a couple of weeks will set me up for a future of better health. Wish me luck! I don’t spend much time here these days for a whole lot of reasons, but I miss blogging. Instead of giving up entirely, I am back blogging the kids adventures over at superRelish. Drop by and see what they have been up to. Eventually, when I am feeling more confident, I will add a myRelish feature to that blog. Thanks for keeping me company here, I hope to see you over at superRelish some day. I miss blogging but this place hasn’t felt like home in a while now so I am going to reinvent myself in blogland. If I think back to why I started blogging, it was to have a journal for the kids of their adventures so I will start with that. I want to play catchup and fill in the gaps on what I haven’t posted so that their story is complete. I still want to have my own space to be a part of a community so I think I will have a meme page. I miss doing things like Sunday Selections and Sundays in my City. I am sure there are others that I would love to do, that shares bits of me without sharing too much. In the meantime, I am in India and am far too busy to even think of blogging properly! Crazy busy seems to be the theme of the year around these parts. Finally we had a weekend with nothing planned and nothing to do so instead of doing nothing we went looking for record breaking adventures. 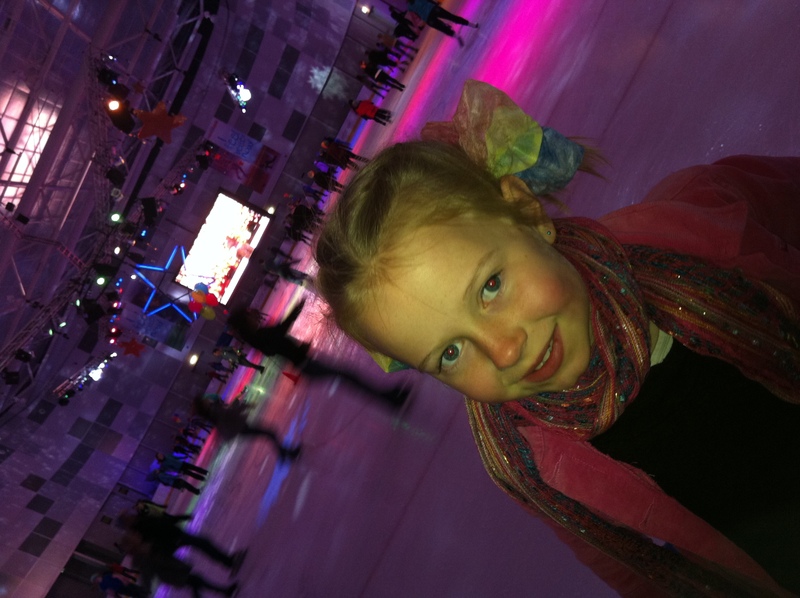 We headed down to Icehouse to take part in the the World Record attempt of the biggest conga line on ice. Knowing that we would be out on the ice and hanging on tight, there was no point taking a camera with me. Naturally I did have my phone so I did get a quick snap of girl-child as she headed back out for another skate before the conga line began. I don’t think that we had enough participants to make the world record (official number released tomorrow) but we had a great time. I have to admit that it is harder than it looks to skate in a huge conga line for 15 minutes! We were in the middle of the line, man-child at the front, followed by the kids and then me and all hanging on tight. We managed stay together and not break our section of the conga line. Even if we didn’t make the record yesterday, we had a great time. We will have to go back for another attempt next time. Head over to Unknown Mami and check out some of the adventures others have had during their Sundays in my City. 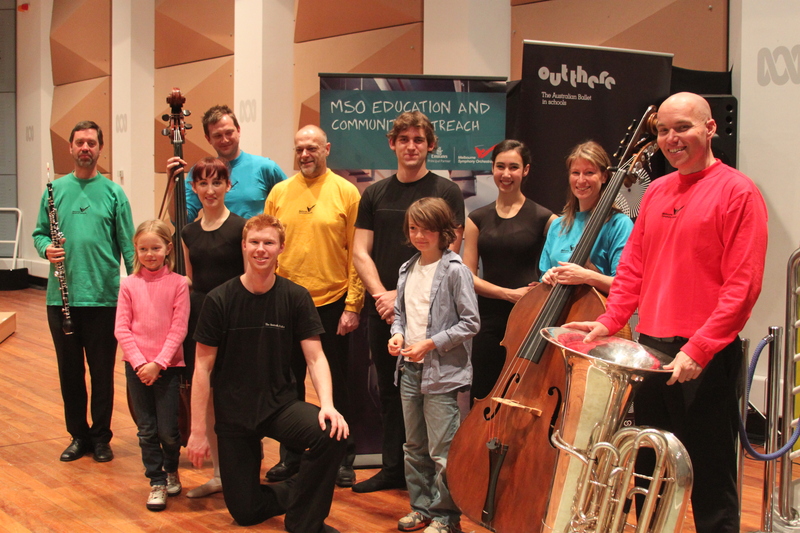 For years, when the kids were little, I would read about performances of the Melbourne Symphony Orchestra (MSO) created specifically for kids to enjoy. Of course with the juggle of work, other kid stuff and generally being too busy, we never made actually made it to a performance. I was delighted when I was contacted by Alison a the Melbourne Symphony Orchestra to offer me tickets to take the kids along to a performance. As usual, we had a crazy busy weekend ahead of us but the planets aligned and ice-skating was moved back a few hours so we had a morning free – the perfect opportunity to finally take the kids. Alison did stress that the performance was aimed at 3 – 8 year olds, that my kids being 7 and 9 might be a little old for the show but I know that they love music and that I want them to love dance again so I was willing to give it a shot, I would take the kids to a performance of Movement Makes Music, a unique collaboration between the MSO and the Australian Ballet Dance Education Ensemble will engage children aurally and kinetically. Performers will highlight the links between movement and music during this 50-minute show, in which audience members will be moved, inspired and enchanted. I must admit that I was hesitant that boy-child would moan and complain all morning (as he frequently does!) so it wasn’t until we were in the car and on the way there that I actually told the kids where we were going and braced myself for the whinging. Guess what? There was none, we were off to a great start! We made it to the venue with plenty of time to spare and found ourselves a spot front and (almost) centre on the floor, ready to enjoy the show. As we were waiting for the performance to begin, boy-child declared that if he was in the orchestra, he would be wearing a green shirt. I wondered why he would wear a green shirt and he pointed out that not only was green his favourite colour but it was also the colour that the woodwind musicians were wearing and since he plays clarinet he would have to wear green too! He then went on to point out that the string section were wearing blue shirts, brass in red and percussion in yellow. Already I was impressed at how much he was enjoying being there and the performance hadn’t even begun! I really didn’t know how the show would be tailored to suit young children but found that the conductor used the time between pieces to introduce a different member of the orchestra, highlight the instrument that they played and talk about how it would be played in the next piece of music. The dancers from the Australian Ballet were beautiful, showing how music can be influence dance and movement. Girl-child barely blinked the entire time that they were on stage. Boy-child was entranced by Patrick tap dancing different rhythms and then hearing Rob repeat the rhythms on a drum. He was even more impressed when Rob beat a rhythm on the drum that ended in a drumroll and Patrick was able to tap that same rhythm and drumroll. Sure my kids were amongst the oldest there but they had a great time. In fact they both had such a great time that they are wanting to know when they can go back to the symphony. I don’t think the planets will align to allow us to go back during the school holidays but if they do, this is what I would love to go to – Peter and the Wolf. Prokofiev’s story of the irreverent Peter has resonated deeply with generations of children, enchanted by its power and sense of fun. Now BreakThru Films and Se-ma-for Studios, in collaboration with BAFTA-winning director Suzie Templeton, bring this mesmerising and enchanting classic to the big screen. Thanks to MSO, I was lucky enough to have free tickets to take the kids along to see Movement Makes Music, but the opinions expressed are mine and those of my kids. We had a great day and only wish that we had discovered MSO Family Classic Kids a few years ago. Family Classic Kids is the MSO’s popular program of concerts for children aged three to eight years of age – and a great way to introduce young people to the wonders of orchestral music. With the children sitting right next to the Orchestra, there are opportunities to sing along, respond to the music with movement and actions, follow a story and maybe even conduct. As a bonus, the kids had their photos taken with some of the musicians and the dancers! Being shy around the amazing performers! Don’t just listen to me rave on about how much fun we had at MSO, check out what my kids thought here and here, also head over to Stuff With Thing to see what Heidi and Annie thought too.